Our mission at Cool Rays is to be a professional and knowledgeable air conditioning and heating company who sets the bar for service, quality, and care above the rest. 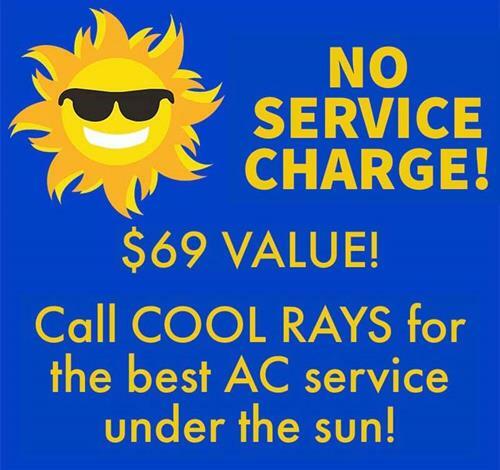 Cool Rays Air Conditioning and Heating is a family owned and operated with the pleasure of servicing clients in Brevard County, Florida. We are a licensed and insured full-service residential HVAC company who is passionate about giving our clients the best service under the sun. Cool Rays provides 24/7 emergency service to ensure the comfort of our clients is the best possible. We are here to help through the full lifespan of an HVAC system, whether it be routine maintenance, unfortunate breaks, and repairs, or eventual replacement of a system. Fair and Upfront Pricing - Our Straight Forward Pricing Guide lets you know the price before we install or repair your AC unit. A Cost-Benefits Analysis - We want to provide you with the unit that best meets your needs, so we offer a Cost-Benefits Analysis to help our clients with the decision-making process. Highest Quality Service - Our technicians are dedicated to providing the highest quality service to each and every client.